While, that still applies, my emotions run high today for my city. Images of a grieving family and community and separately, destruction of businesses and general mayhem are difficult to swallow. At the same time, I am moved by demonstrations across the country in the name of Michael Brown, aimed at drawing attention to a system that still needs much work. Let’s not get into an argument about this. I’ve seen enough on social media to see the varying opinions. It is dizzying and frustrating to see folks at both extremes not having any understanding for the other side. 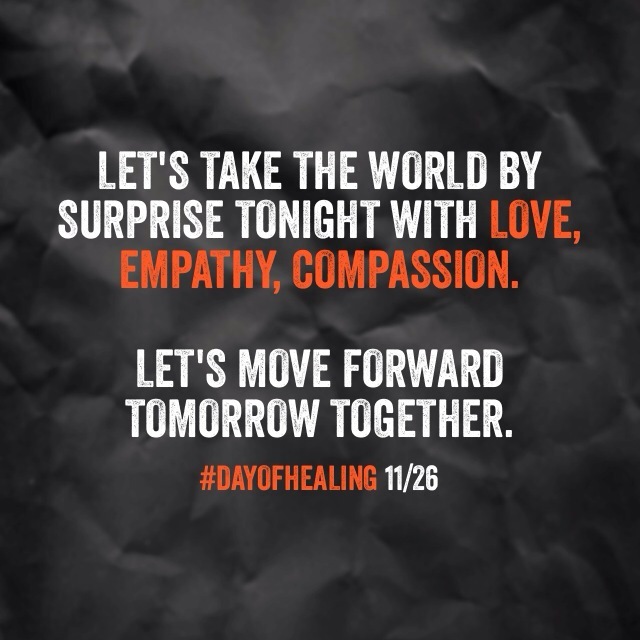 My friend, Danni Eichenhorst, has proposed a #DayOfHealing for today (please see her post on ways to help move forward here: http://artofwellfare.com/2014/11/25/dayofhealing-ways-to-help-move-forward/). Yes, some are still grieving and going through intense emotions over this. It is never too early to begin healing though. No one is acting like any of this will turn around overnight. We can all be a part of making a change though. I challenge everyone to do something, of whatever magnitude, to begin that process today. Post it on social media, not to brag, but to challenge others. 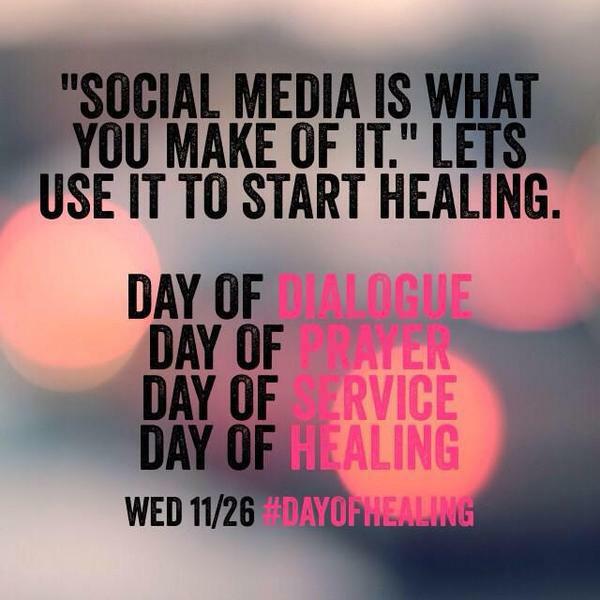 Use the #DayOfHealing hashtag on Twitter, Facebook, and Instagram. As we go into Thanksgiving, I also challenge you this: go outside of your comfort zone. Watch and read news sources other than your standbys. Have a conversation with someone you know you will disagree with, but really listen to each other and ask many questions like: Why do you feel this way? What life experiences have led to this thinking (and consider that for others as well)? That homeless person you see at that same spot, everyday — bring them some food and talk to them like a human being. Instead of avoiding a neighborhood that you think may be violent because of images you saw at night on your TV, like Ferguson or South Grand in the City of St. Louis, make a point to drive through it rather than avoid it entirely. Patronize a small business or ten. People own those businesses and depend on your business and word of mouth to survive. Why are we so apt to paint with a broad brush? Instead of blaming entire races or groups, make an attempt to narrow down those thoughts. Dear TV media, "Protestors" protest. "Looters" steal. "Arsonists" set things on fire. Please use the appropriate label to match your video. It’s a widely used quote, but “Be kind, for everyone you meet is fighting a hard battle.” Kindness and understanding can lead to greater things. Instead of criticizing, consider what leads someone to a behavior. I mean really consider it. Are you that much of a superior individual? At Thanksgiving with your family and/or friends, challenge them. In my family, it never fails that there is some drama going into a holiday. 99% of the time, it is petty BS. We should enjoy those around us and be thankful of those moments. Challenging those around us to think differently may cause drama, but hopefully perspective is gained by someone. Some may wonder why I’m not pushing for reforms to the system being protested against. While I do find it incredibly necessary, I realize that not all will agree with that. We should however be able to find common ground and healing through a greater focus on being mindful of others. Start there. And if your response is “so and so isn’t mindful of others,” start by reading this again.